It’s been six months since I’ve updated my blog and now I will attempt to share some of what I’ve been up to since March! I like being able to look back through this blog and see all the different stages in my evolution as an artist, so I’m determined to keep it up. In March I went back to New York City to teach at the Grand Central Atelier. It was so fun to re-connect with the amazing community of artists where I myself spent many years as a student, soaking up as much as I could learn. catching up with my lady painter friends Savannah Cuff, Katie Whipple, and Liz Beard! Kristo and I just got home after two weeks in Japan! We went to see for ourselves the legendary powder and it was such a thrill to ride untracked pow every day! We soaked in the natural hot springs, or onsens, tried new food, and hiked into the backcountry where we saw snow monkeys and kamoshikas! I made time for a few plein-air painting sessions when the sun came out and I took a rest day. The paintings are for sale in my store! Reminder: I’m teaching in NYC March 16-17-18 at the Grand Central Atelier. sign up on their website! Last weekend I was in Bozeman, Montana for the opening night of my show titled “Infinite Landscape” at Old Main Gallery. The paintings will be on view until December 30th 2017. It was an incredible feeling to see all my work framed and hung on a gallery wall, and I sold four paintings on the opening day! 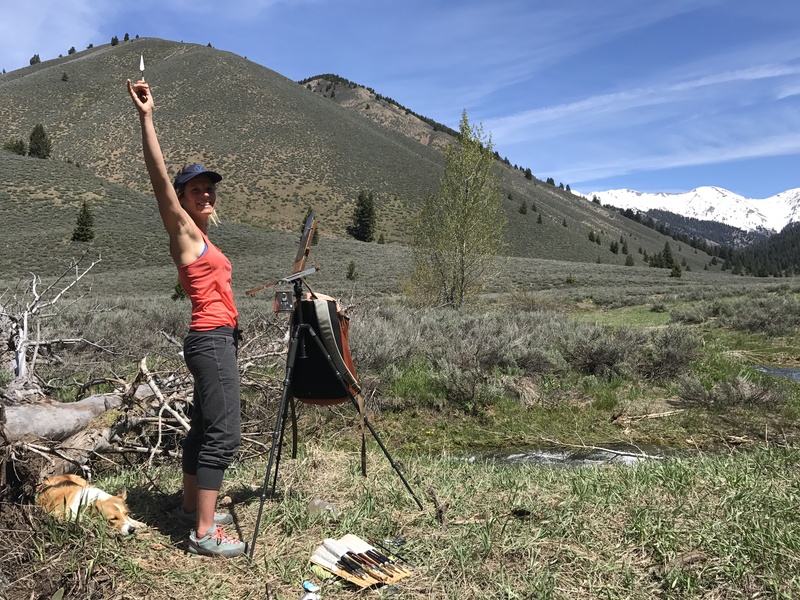 To read more about my work on the American Prairie Reserve, scroll back two posts on this blog, or you can read my essay that was recently published on Patagonia’s blog where I discuss the historical context of landscape painting and wilderness conservation and how I was inspired to paint in this part of Montana. Save the Date: Gallery Show Nov. 4th! My collection of prairie paintings will be in an exhibit at Old Main Gallery in Bozeman, Montana alongside artwork by Monte Dolack and Carol Guzman. A portion of all proceeds will go to benefit the American Prairie Reserve. Opening reception is from 5-7 PM November 4th and will be on view for one month. Over the past two years, I’ve made three different trips to study and paint on the American Prairie Reserve (APR) in Montana’s northern great plains region. 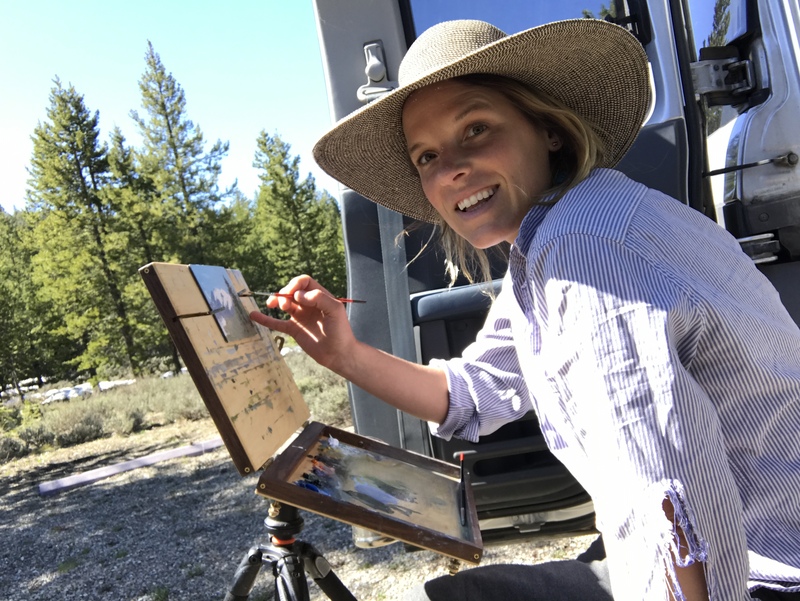 I began this project in 2015 when I was living in New York City and looking for a meaningful story that combined my interests in wilderness conservation, outdoor adventure, and plein-air painting. Located south of Saskatchewan and north of the Missouri River, this zone of eastern Montana has seen very little human impact which makes it feel eerily removed from time. At nearly 3.5 million acres, it is one of only four large-scale intact prairie ecosystems in the world – ninety percent of the ground has never been plowed. The APR is a privately funded conservation organization that is purchasing privately owned land when it comes on the market and then merging it with with leased government parcels. The reserve is currently a patchwork of parcels totaling almost 400,000 acres, and each year it continues to grow. When complete, the APR will be the largest protected landscape in the continental U.S. and home to all the native animals that once roamed the Great Plains. It will provide visitors an unparalleled opportunity to experience the history and heritage of this landscape in all it’s wild, hostile beauty, and it will be proof of nature’s inherent ability to re-establish balance when given the chance. At a time when so many of our wild places are under threat, the story of the APR offers hope and inspiration for us to keep fighting for wilderness conservation. All of the paintings in my collection were made without the use of photographs, instead I relied on direct observation from life, or memory in the studio. These paintings represent two years of exploration and research, celebrating the beauty I found on the prairie, from the fleeting gumbo primrose to the infinite horizons. Lately I’ve done a lot of writing to share my story and promote this show, so if you’re curious, below are all the links where I’ve written about this project and what it has meant to me! Wow, it’s been a whole year since I updated my blog! I’ve found it so much easier to share my news on a daily basis through Instagram, but for this blog’s record here is my latest: I’ve just moved to California! 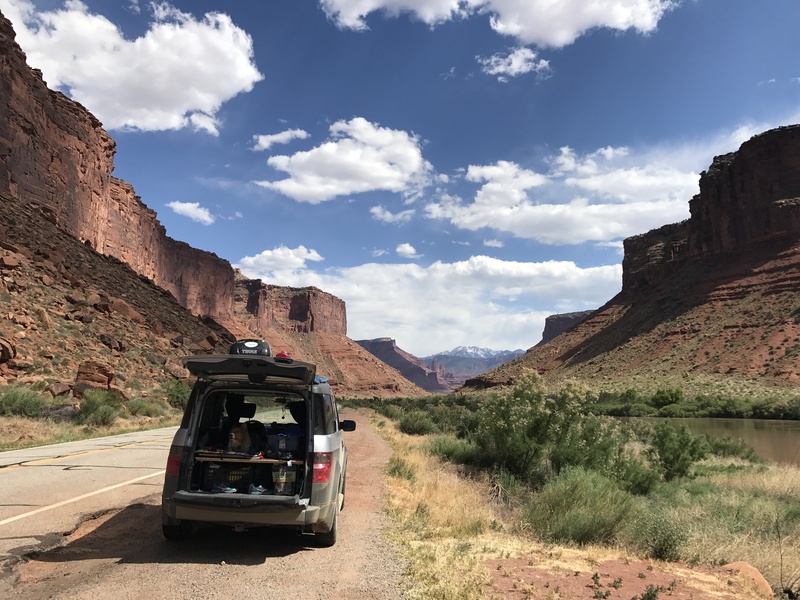 In April I sold and gave away almost all my belongings and moved into my Honda Element with my dog Honeycrisp fora two month road trip, camping and painting my way across the country. I left Vermont on May 7th and began an adventure I’ve been dreaming of since my early 20’s. To say the least, this trip has felt like a momentous achievement for me! After almost eight years in New York City, I moved home to Vermont in 2015 where I spent a year and a half re-evaluating my life. It felt so good to be out of the city, but I was shell-shocked from the intensity of my experience there and it took some time for me get in touch with my intuition and allow myself to follow my heart again. During my year in Vermont I experimented with a lot of different ways to use my skills – teaching workshops, working as an adjunct professor at Champlain College, teaching weekly classes, painting commissions, and selling gallery work. 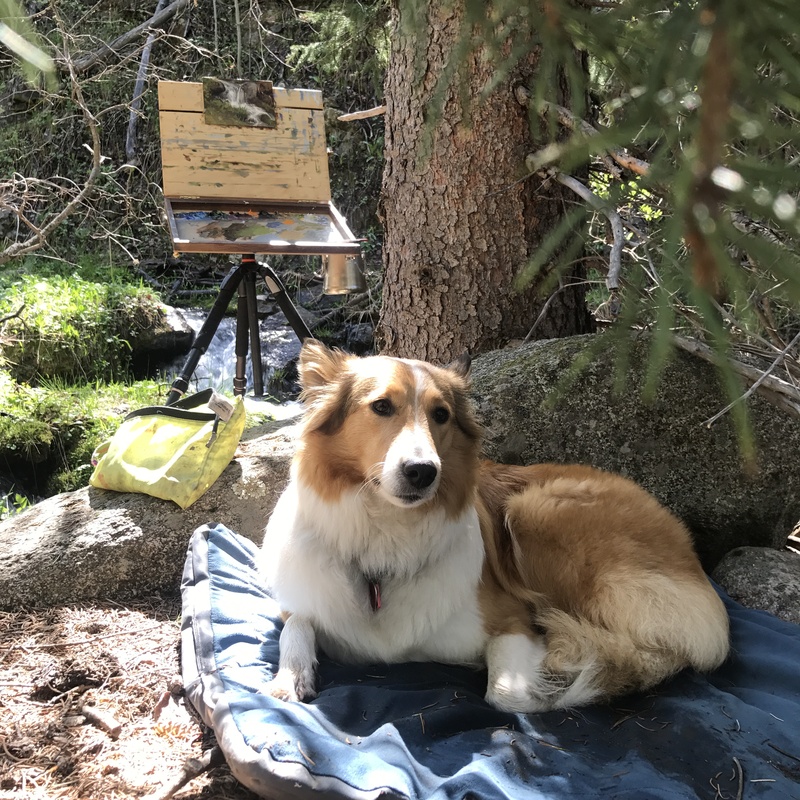 I realized that what truly makes my heart sing is plein-air painting and spending time outside on long trail runs in the mountains, climbing, and practicing yoga. Once this became clear to me, I started making some changes in my life so I could spend more time doing the things I love. I moved to Santa Barbara, CA to be with my boyfriend Kristo and when I decided to make this move, I saw it as the perfect opportunity to indulge my fantasy of doing nothing but plein air painting, camping, and climbing for two months as I drove across the country. In the first month I made twenty seven paintings and posted them for sale in my online store. Within four hours, almost all of them sold! Now it’s been two months and I have another twenty paintings to sell, so if you are interested in being the first to know when my next sale begins, Sign up for my newsletter. The success of my last sale was a huge affirmation that I am doing the right thing by following my heart and doing what I love. I’m feeling so grateful for all the things that bring me so much joy, and that I’ve found a way to fill my life with them! Now that I’m in Santa Barbara, I’m getting settled in, looking for a new studio space, and spending plenty of time painting at the beach and in the mountains. Life is good and I’m thrilled to keep up the momentum! Stay tuned (instagram or my newsletter are the best ways to stay in touch with me!) for future workshops, more paintings for sale, and stories from all the new places where I’ll be exploring and painting on the west coast! Last weekend’s inaugural farm-to-canvas plein air painting workshop at Golden Well Farm and Apiaries was a huge success! I had eight students, three who stayed in B&B rooms at the farmhouse (and one who opted for the $20/night camping option) these folks were treated to a beautiful farm-to-table breakfast each morning while the rest of us convened at 8 AM for a full morning of painting. While the weather was a little wet, we managed to work around the rain and get some good painting time in. For lunch we sat down to a three course meal made with ingredients picked that day on the farm or sourced from nearby dairy and meat producers. A special treat was the honey kombucha, and honey caramel sauce sourced from Golden Well’s own bees! I am so grateful to our hosts Nicole and Ryan for their hospitality, generosity, great cooking, and for sharing their home with us. As I mentioned in an earlier post, this is the farm I grew up and it’s been the most wonderful turn of events for me to feel welcomed back to the farm by it’s current residents. While our group was quietly painting, we were able to witness the rhythm of life and work on the farm, which involves several employees, visiting interns, and Miela, Nicole and Ryan’s 3-year old daughter who was a constant source of entertainment for all of us. We were also treated to an impromptu yoga class taught by Jennifer Parmelee after painting one day, and I am now convinced this will be an integral part of my next workshop. As any artist knows, the long hours focused in front of your work can leave you feeling stiff, emotionally drained, and tired. The yoga session was just what we needed to loosen up and re-set our energy with a positive vibe. After this I am excited to plan future painting workshops that intentionally combine yoga and mindfulness practices. Our workshop also coincided with some fun local events – Friday night we went to Lincoln Peak Vineyards a mile down the road for picnic party with a live band and 300 people in attendance! Saturday night we strolled through downtown Middlebury and went out to dinner together, and Sunday night ended with a community pizza night on the farm with live music, brick-oven pizzas, rustic hay bale seating, and desserts made by neighboring farmer V Smiley Preserves. Currently we are looking at some dates in September for the next workshop/retreat at this location! Scroll through these pictures for more detailed account of our weekend on the farm. Thank you to all the wonderful students who took the time to travel up to Vermont and spend the weekend with us! Workshop students in the zone while lunch goes on the grill. Our workshop ended with a community pizza night! Outdoor wood-fired brick oven pizza made from scratch with garden fresh veggies and local meat and cheese. Live music from one of my childhood buddies Nate Wallace Gusakov, and desserts made by neighboring farmer Vera Smiley. MARCH: An energizing trip to the 4-corners region to work with an inspiring crew of artists while being filmed and interviewed for Convergence Film, a project by 3 Strings Productions. Film release to be announced, so stay tuned! MAY: SPRING!!!! Painting outside, lots of hiking, teaching plain-air class along the lake, loving life! The location for this workshop is very special to me because this was my childhood home! Our family enjoyed ten blissful years on this idyllic farm, and it is an absolute dream come true that the current owners are welcoming me back to their property to teach a workshop. Golden Well Farm and Apiaries will be hosting us and providing a chef catered farm-to-table lunch each day, featuring food grown here on this property. Make sure to bring your swimsuit because there is a beautiful river running right across the front yard! Locals all know of the “Old Nash Farm” and it’s rich history as a working farm that has nurtured generations of different families who lived here. It’s newest incarnation as Golden Well Farm and Apiaries promises that the legacy of wholesome farm family fun will continue! The best part is that we can all take part through the community minded events they are offering, including a CSA, a summer camp, and yoga classes. 1:30 – Students will continue working on their paintings while receiving individual instruction throughout the afternoon. 3:00 – end of class, swimming in the river! Students are free to continue working on their own. 8:30 – Demonstration of full color painting focusing on foreground objects. Cost: $450 per person. Includes 3 chef catered lunches. Early bird special: $400 before May 1st. Lodging: Rent a room on the farm through Airbnb (choose from room one, room two, or room three). OR pitch a tent in the field for $20/night (includes breakfast and facilities). Other local options can be found in Middlebury. Sign Up: and pay online here, or email me if you have questions: emlee7@gmail.com. I will send a packing list for gear and materials list to confirmed students.